Research by South Korea's top human cloning scientist - hailed as a breakthrough earlier this year - was fabricated, colleagues have concluded. A Seoul National University panel said the research by world-renowned Hwang Woo-suk was "intentionally fabricated", and he would be disciplined. 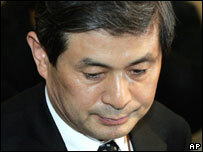 Dr Hwang said he would resign, but he did not admit his research was faked. "I sincerely apologise to the people for creating shock and disappointment," he said after the panel's announcement. "As a symbol of apology, I step down as professor of Seoul National University." However he maintained that the science behind his work was sound, and that his country's scientists were still leading the field. "I emphasise that patient-specific stem cells belong to South Korea and you are going to see this," he said. Proponents of human stem cell cloning say it could one day help cure diseases including diabetes and Parkinson's. The controversy has been causing shockwaves in South Korea, where the cloning pioneer is widely considered a national hero. Since 2002, he has received $40m (£23m) in grants from the science and technology ministry alone. He made news around the world when he announced in August that his team had created the world's first cloned dog. The veracity of that research, as well as an earlier paper on the first cloning of a human embryo, will now be subject to review by the same panel, says the BBC's Charles Scanlon in Seoul. In May, Dr Hwang published a paper in the journal Science, saying his team had extracted material from cloned human embryos that identically matched the DNA of 11 patients. It was claimed such a technique could be the key to providing personalised cures. 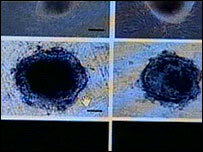 But the university panel said that all 11 sets of data were derived from only two stem cell lines. The panel said it still did not know whether those two stem cell clusters had actually been cloned. "Based on these findings, data in the 2005 Science journal cannot be regarded as a simple accidental error but as intentional fabrication made out of two stem cells," the investigators said. "This is a serious wrongdoing that has damaged the foundation of science," it said. "Professor Hwang admitted to having played a role in extending the data of the two stem cell lines to those of 11 stem cells," Roh Jung-hye, the university's dean of research affairs, told a news conference. Dr Hwang came under pressure when one of the co-authors of his paper, Roh Sung-il, said that some of the pictures illustrating it, apparently showing the 11 patient-specific stem cell lines, had been faked. He said photographs of nine of the lines were doctored from the other two. Last week, Dr Hwang admitted the photographs did contain "mistakes", but insisted the research was accurate and that he had cloned 11 stem cell lines. Scandal erupted around the doctor a month ago, when he was forced to step down as chairman of South Korea's World Stem Cell Hub, after admitting that eggs for research were donated by his own female colleagues, in breach of guidelines. He was admitted to hospital earlier this month suffering from stress.